Flex an often over looked aspect when talking about surfboards, plays a huge roll in your surfboards performance. When people do talk about “flex”, they are usually talking about fins and fin design. We have even mentioned the importance of flex before, but it was also relating to fins in our, The Definitive Surfboard Fin Guide article. Here, however, we will discuss the flex in your surfboard. Flex in a surfboard is very much the same principles as the flex in fins…Flex = projection, which means your speed when coming off the bottom, or helping to lay into a nice speed turn off the top. This projection comes from your board bending, or flexing, into the shape of the wave with the force you put down on it, and how it snaps back into shape. It stores up all of that energy and releases it, projecting you forward. Tom Curren’s classic bottom turn, making the most out of the flex and projection. Look at it this way…when you drop into the wave and come to your bottom turn, your board will bend somewhat to the shape of the wave when you power down onto it. This causes a build up energy in the board as it is bending out of it’s natural shape. Now, when you start to drive up the face and your weight begins to lift, your board recoils back to it’s original shape, releasing all that pent up energy and projects you through your turn. The better you become at surfing, the more you can feel this flex and use it to link your maneuvers while constantly generating speed down the line. The trick, for shapers, is knowing how to manipulate this to get the ideal flex properties they are looking for. How do we control Flex? Since Polyurethane foam blanks were discovered for surfboards and came into use, wooden strips, call stringers, needed to be used down the center of the board. This helped increase the strength of the board and stiffen it up a bit. This was especially handy on longboards since they tend to flex or bend quite a bit more due to their length. Shapers soon figured out that the strength and flexibility of the board could be controlled by using stringers of various thicknesses. And sometimes multiple stringers would be used for the same effect, with the added bonus of looking aesthetically pleasing. A typical Stringer found on the majority of boards still to this day. As shapers and surfers started paying closer attention to the flex and projection of a surfboard, the stringer placement and materials available started becoming more crucial. Still the most common placement for a stringer is down the center of a board. This holds true for every type of board and is more or less the status quo for boards around the world. 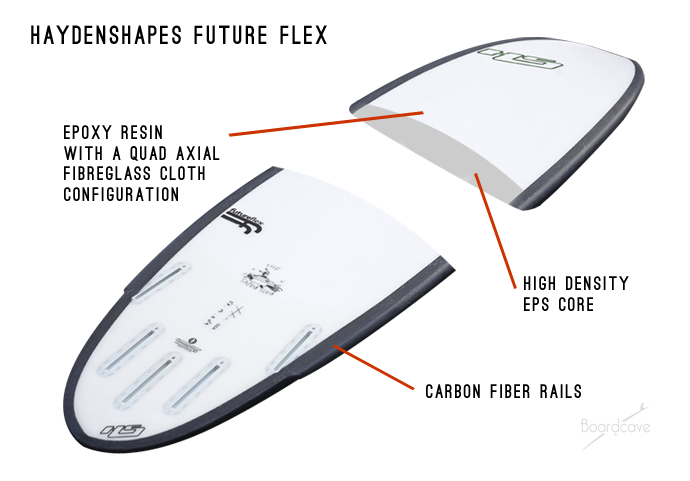 A board with the center stringer will feel nice and strong under foot which is important. Much of the force put down on your board will be from your feet down the center of the board. This stringer placement however, leaves the rails to be much softer which can result in them flexing, twisting and wobbling differently. This is called torsional flex and can result in slowing your board down a bit. By placing the stringer out towards the rail, you can stiffen the rail line up and give it more spring along its perimeter where the board is in contact with the water when going through turns. Parabolic stringers are often used in this case, where the stringer follows the curve of the rail instead of in a straight line. While some shapers choose to continue to use wood for both the centerline and parabolic stringers, others have begun using alternative materials like carbon fiber tape down the center or wrapped around the rail to give the same parabolic stringer effect. Carbon fiber has a fantastic strength to weight ratio, so you can essentially get the strength you need with a fraction of the weight added to the board compared to traditional wooden stringers. Haydenshapes Future Flex Technology utilizing carbon reinforced parabolic rails. These parabolic carbon stringers, like the Future Flex option found on many Haydenshapes Surfboards, give you all that controlled flex and projection out at the rail, helping to snap your board back into shape and project you down the line in a more efficient manner. The Future Flex technology is said to feel lively and a little springier than a traditional stringer. Another way carbon is used instead of a parabolic stinger, is wrapping it around the board in strategic ways to help control the flex. DMS and Lost in Australia have been playing around with this technology called “Carbon Wrap” with great success. A clean Album Reboot in Hyrdo Flex Technology. There are also other ways to help control and prevent too much torsional flex from happening. Different types of foam, or lamination processes can help to minimize the amount of torsional flex on traditional stringered boards, or stringerless boards altogether. 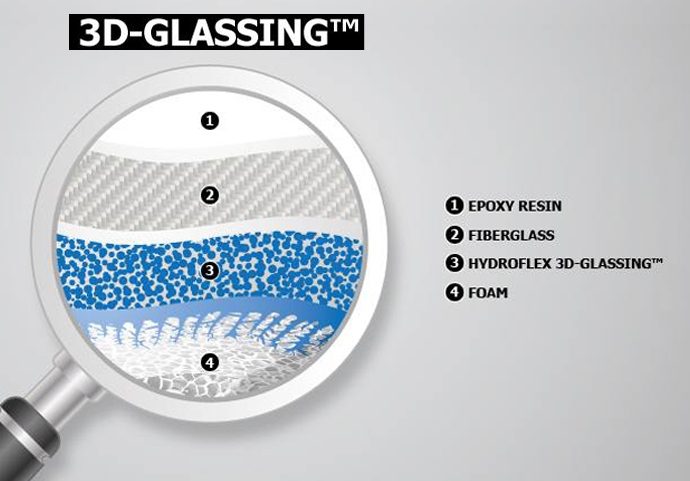 Cross section illustration of how Hydro Flex Technology works, anchoring the fiberglass “skin” to the blank. Hydro Flex technology is a lamination process that actually anchors the fiberglass skin to the foam. 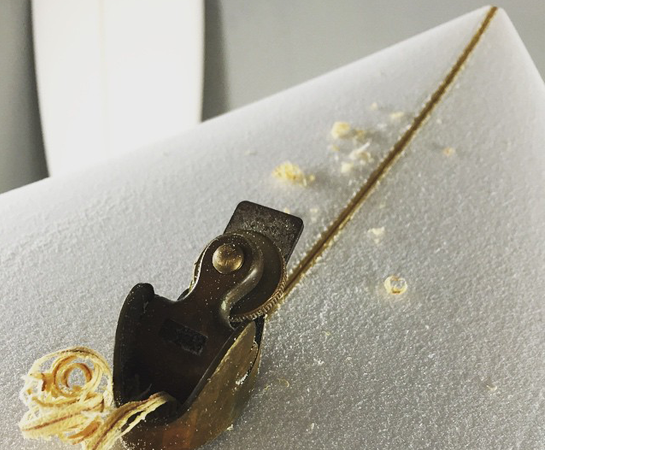 This not only gives you a much better bond, helping to prevent delamination, but also helps to stiffen the whole board all the way out to the rails to some degree. These boards also feel lively underfoot, but slightly different than a board with parabolic stringers of whatever material. Shaper Jeff “Doc” Lausch of Surf Prescriptions was an early user of Varial Foam with great success! Varial Foam is somewhat of a new technology to the surf industry, but has been used in automotive and aerospace for years. This foam is uniform in density throughout and is around 7 times more rigid than standard polyurethane foam. You don’t need a stringer in one of these boards except in extreme circumstances like a big wave gun or tow board (in which the stringer needed would be extremely thin). Without the need for a stringer, boards made with Varial Foam have a more consistent flex throughout. A foam that is more rigid and has no need for a stringer, resulting in a board with a lot of spring and projection. The added bonus of this foam is that it is about 20% lighter than PU, and can be glassed with any kind of resin. 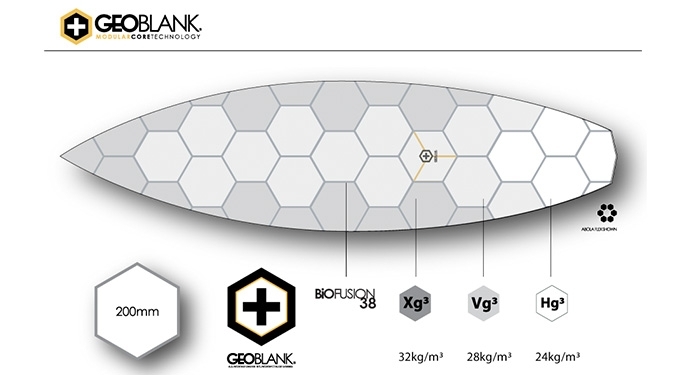 Another technology coming out of Australia and making landfall in the US is the GEOblank tech. This is essentially combining EPS foam of different density in strategic areas throughout the blank. The individual pieces are in a hexagonal shape and glued together in what ever manner needed. This way the shaper can request that the nose of his blank have a slightly different flex pattern than the center or the tail. Even the rails can be more rigid, whatever needed to get the desired flex. 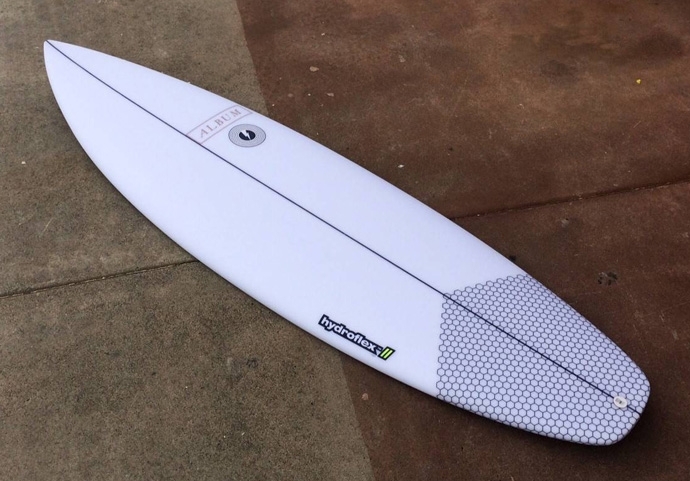 Panda Surfboards making use of the X-Flex pattern in GeoBlank Technology, keeping torsional twist down. We haven’t even begun to hit the countless amount of other materials, technologies and ideas that are currently being explored. People are looking to other areas of life to get wonderful ideas…the way a fish (not surfboard) is shaped, they way its scales are laid out along its body, etc. One thing for certain is that more and more people are taking serious notes on how surfboard flex comes into the whole equation of what makes a certain board ride the way it is intended to. Controlling flex is the next frontier in surfboard design breakthroughs, and there are more experiments being tested everyday. Make sure you check out the Board Engine to find a range of boards all made in America by professional shapers at the top of their crafts. Email service@boardcave.com with your details for a detailed report of board recommendations for you.